Day 4 Over! The Finals Await! Going 2-1 in PK's, the 01 Elite Girls win the semi's! The semi-final match is over. Now it's time for the grand finale..! 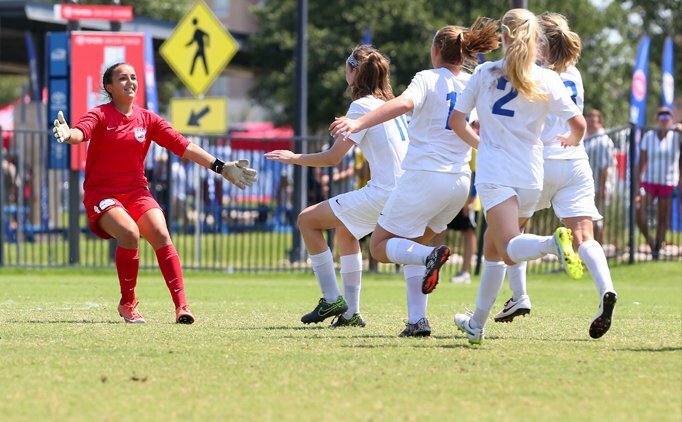 The BRYC 01 Elite Girls won their match today in the US Youth Soccer National Championships! After two action-packed halves, and a scoreless overtime, the Elite managed to pull out a win in PK's -- going 2-1 and defeating the USA Stars 02! This semi-final victory is an incredible achievement, but the Elite have their eyes set on the prize. The finals match will be played at 9:00am (EST), and the Elite will be facing a familiar enemy. The defending champions, PSG MI Gators 02 Orange, won their semi-finals game as well. They will be facing off against the Elite tomorrow for a rematch to end it all..! The match will be live-streamed, and the link has been posted below! Remember to tune in and cheer on our girls as they fight to bring home the gold, the glory, and the win.